“Got Pot?” the rear window of the delivery van asked me on a four-lane road in Denver. An amusing question, as not until next Tuesday will Colorado groceries and convenience stores be allowed to sell “full-strength” beer, for the first time since Prohibition was repealed. The 28-year legislative battle over real beer in Colorado began in 1990, when dozens of grocery and convenience stores, including Safeway, Albertson’s and 7/Eleven, began lobbying the Legislature to allow them to sell real beer — not just near beer, or 3.2 beer. Opposing the grocers was a strange coalition: abstinence and sobriety groups, many of them with religious affiliations — and the liquor industry. The state’s liquor stores (1,600 of them today) fought the grocers for 28 years, but will remain Coloradans’ only conduit for booze and wine until 2037. For the record, state Sen. Vicki Marble, R-Fort Collins, owns not just a liquor store, but also two bail bond agencies. What a patriot. Well, state Sen. Marble, if you lose money to the groceries and 7/Elevens, you might make it up on bail bonds. What you lose on the swings you make up on the roundabouts. Gov. John Hickenlooper signed SB 243 into law on June 4, alone in his office, “without a single person to witness the event,” according to the Business Journal. Hickenlooper, a presumptive presidential candidate in 2020, began his career as the owner of a Colorado brewpub. Let us not forget that Franklin Delano Roosevelt was elected president in 1932 on a “wet” platform, and that Prohibition was repealed during his first year in office, in December 1933. FDR laid the cornerstone for the grave of Prohibition in April that year, by signing a bill that allowed sales of “nonintoxicating” beer — aka near beer or 3.2 beer. After repeal, Colorado created a liquor code that clamped down on real beer and near beer: prohibiting bars from selling near beer without food; barring sales on Sunday; and allowing cities and counties to enact local prohibition laws. Even Boulder — hippest of the hip — did not relax prohibition of the sale of real beer until 1969. I hitchhiked through Boulder that year. Everyone who picked me up was high on pot. But getting back to SB 243: It prohibits stores from “dumping” beer: selling it at a loss. 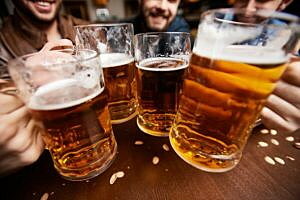 It could prohibit beer-drinking in some state and local parks, as state still law limits consumption there to 3.2 beer. Local authorities will decide. Denver, for example, will allow adults to drink real beer in city parks in 2019, then evaluate the situation.